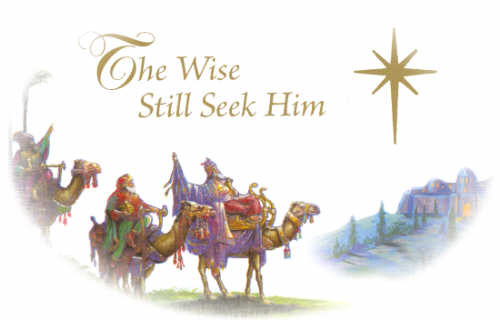 Wise men came from the East where the prophet Daniel had lived to find the newborn savior Jesus. They were taught what to watch for by Daniel some 600 years earlier. Unlike the spotty knowledge of the Jewish religious leaders at the time of Jesus’ birth, these wise men actually believed what Daniel had taught them. If the scribes, Pharisees and Sadducees had taken heed to the Scriptures, they would have already known when and where the Christ would be born. But those who thought they were wise missed the whole things. Those who were wise did two things. They acted on that belief and honored the King of Kings and Lord of Lords by delivering gifts to him in his infancy. That is all God asks, isn’t it? Believe Him and act on what He says. The blessings then flow in super-abundance to those who do these things. So how wise are you? Are you wise enough to take God at His Word? Consider these things. The entire Old Testament from Genesis 3:15 through the end of Malachi have a single subject: the promised seed of the woman who would crush the head of the serpent that beguiled mankind. The subject of the four gospels is the birth and on-earth ministry of Jesus Christ. The subject of the book of Acts is the things Jesus continues to teach and do. The subject of the church epistles from Romans through II Thessalonians is Jesus Christ, what he accomplished and the promise of his soon return for the Christian believers at the end of this age of grace. The subject of the leadership epistles, I Timothy, Titus and Philemon is Jesus Christ and Christian leadership’s subjection to His authority along with how to work with Christians, the body of Christ. The subject of the dispersion epistles, I Peter, II Peter, Hebrews, I, II, II John and Jude is of course Jesus Christ, his soon return, and encouragement to not pass up the present opportunity to enter the Kingdom of God on God’s terms, through His Christ. The subject of the book of Revelation is — guess who? — Jesus Christ. In fact, the title of this book is The Revelation of Jesus Christ, not meaning revelation about him but his actually being revealed to the human race once again, this time as King of Kings and Lord of Lords. Now with all that subject matter about Jesus Christ in the Bible, have you any doubts what God’s intended purpose of writing all 66 books of the Bible was about? The Bible is none other than God’s testimony of the fall of creation and his magnificent plan to set all things straight. Jesus Christ, the only begotten Son of God, was and is God’s plan and purpose from before the overthrow of the earth (Ephesians 1:2). If you are wise, you will seek Jesus too. His is the only name given whereby men must be saved. If this all seems a big strange to you; if it all seems a bit nonsensical, all I can tell you is you need to read and study the Bible. It tells us that faith is not something you come up with on your own. Faith is something you have to receive from God himself. How does he dispense this faith? When someone tells me they have no faith, I know they have insufficient knowledge of the Bible. How do I know? Because the Bible tells me so! Faith comes directly from God’s Word and that requires you to learn it and understand it. No, not the whole thing — it’s too vast. But you have to start somewhere and God honors the little we do understand and believe. For those of you who refuse this instruction and prefer to stay in your own man-made wisdom, here’s what God has to say to you. I Corinthians 3:18 Let no man deceive himself. If any man among you seems to be wise in this world, let him become a fool, that he may be wise. God is always working to bring people to the knowledge of the truth. One day He will accomplish it fully and completely. II Timothy 2:4 [God] Who will have all men to be saved, and to come unto the knowledge of the truth. There are two kinds of ‘wisdom’ available to us. One is ‘worldly wisdom’ or philosophy. Philosophy forever seeks to explain the metaphysical but has no reference by which to discern truth from error. Philosophy is what I call ‘lazy science’ in that it’s a guess made by observing certain phenomenon. The difference between science and philosophy is that science always has a way to disprove a theory and if it can’t be disproved it is accepted as a viable theory. However in philosophy, it’s all a big guessing game. You can rest on the guess or you can rest in God’s revealed Word. It’s your choice. I Corinthians 3:19 For the wisdom of this world is foolishness with God. For it is written, He takes the wise in their own craftiness. This is your opportunity to gain the wisdom God wants all mankind to have. It’s within your reach to seek Jesus Christ through the written Word of God and so find the wisdom that others have willfully refused. Now is the time my friend, now is the day of salvation. Be wise with God’s wisdom and you will be just like those early wise men who did whatever they had to do to find the King of Kings and Lord of Lords. They traveled long but did not grow weary. God sustained them and guided them with a special light. He will do the same for you. Get seeking!